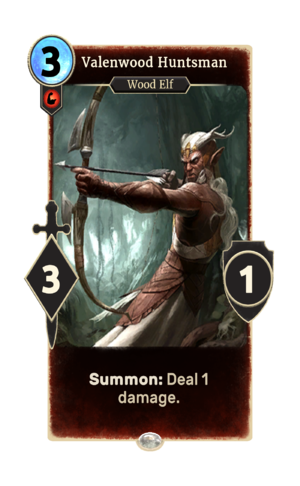 Valenwood Huntsman is a common Strength creature card. It is part of the Core Set. In addition to the card's availability in the Core Set, two copies are included in the Band of Survivors deck. "This day will be mine." "Time to pay Z'en's price." This card was previously part of the training mechanic where it could be upgraded from Valenwood Trapper at level 2. The card is named for the nation of Valenwood. Playing the card's summon ability counts towards the Arrows Fired statistic. This page was last modified on 25 February 2019, at 02:01.